Designed to increase welding operation productivity in less space, Kawasaki Robotic’s new RA Series of welding robots is faster than its predecessor, has a reach up to 1925mm and a compact width of only 584mm. The RA Series comprises two versions – the RA06L, a 6kg payload version with a 1650mm reach, and the RA10L, a 10kg payload version with a 1925mm reach. Using the latest Kawasaki E- Controller, the RA Series robot has dedicated welding software with intuitive weld specific terminology used on its teaching pendant and programme structure. 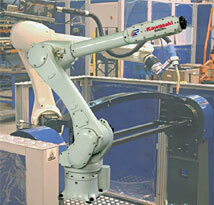 The E- Controller also helps to make the RA06 and RA10L robots faster, smoother and easier to integrate. Additional axes control is available for applications requiring synchronised manipulation during the weld process.